Welcome to My Cozy Corner *2013* edition. The weather here in the far northern end of California has been bitter cold. We had some snow and I took a few photos of the scenery in the garden. Go Here. Then the temps dropped down to the low 20's for a few days. I have a very sunny window in the dining room, so I decided to photograph a few vignettes of my new tea set I received as a gift before Christmas. I think it's incredibly beautiful. Lomonosov Russian Porcelain made in Russia and I have an idea what the pattern is. But not sure enough to go public. If any of you know the pattern, please make a comment or e-mail me. I keep a binder on my china for future reference. You never know when you might have to liquidate a collection. Hopefully I have six granddaughters and they will be interested in collecting china also. The little cherubs are sunning themselves in the window. 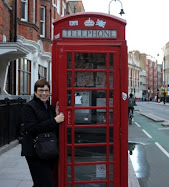 During January, 2013 I'm going to dedicate my posts to all things Blue and White. I love Blue and White. In the fall of 2012, I collected a couple of new Blue and White tea cups and saucers. I will be sharing them with you during my January Winter Blue and White. This Blue and White tea set was a bonus and a complete surprise to me. ENJOY! I'm also going to try and improve my camera skills. The garden is bare this time of year and I needed a little something floral. I added baby's breath from the grocery store to this rather amazing Vintage Viking Cobalt Blue Swung Art glass vase from my mother's estate. It added just the right amount of flower power to my vignette. Lemon Squares Supreme Go Here for recipe. I gave the cuties a new coat of white paint. They were a little dingy hanging in my mother's bedroom for so many years. How many ways to display tea cups? I don't know, but I love every way possible. Need a romantic touch? Add a burning candle. Hope you enjoyed the Winter Blue and White. Please come over for tea soon. The kettle is always ready and I have a great selection of teas. Blue is such a pretty color. Very pretty tablescape. Your Lomonosov Russian Porcelain is just gorgeous. I think your photo skills are great too! Very pretty vignette and sweet angels. You did a great job painting them! How truly lovely, wow- your post is just beautiful. Thank you for this lovely invite to tea. Very pretty mosaic of your beautiful blue and white dishes. I loved the touch of yellow sunshine that showed up, too. I see nothing wrong with your photography whatsoever. My daughter started collecting Lomonosov China for her wedding a couple of years ago. It is so pretty. One can never go wrong with blue and white. The tea set looks lovely with the sun shining through the window. Lovely vignettes. It is a lovely tea set, the blue and white would be favorite too. Beautiful vignettes and photos. Have a happy week! Your dishes are just lovely! I don't know the pattern, but I like it. Betty, I loved your blog and that beautiful Russian china tea set.....thank you for making we lovers of everything beautiful happy! Such lovely photographs and so beautifully arranged. I love your blue and white china, especially with the sun shining through - beautiful! what a beautiful set of china. I love the way you have photographed it in the beautiful sunny window light. Lovely. Lemon squares supreme - delicious! Your photography skills are already quite good. I don't know how you could improve! I love your new tea blues; thanks for sharing. I sure wish I COULD come over for a cuppa. Your tea vignette looks so pretty, Betty. I love the blue and white and I especially love your little folding terver. Happy New Year, Betty! Your blue and white is beautiful and looks wonderful sitting in that sunny spot. A lovely Christmas gift and a delightful addition to your collection. Thank you for joining me for tea. 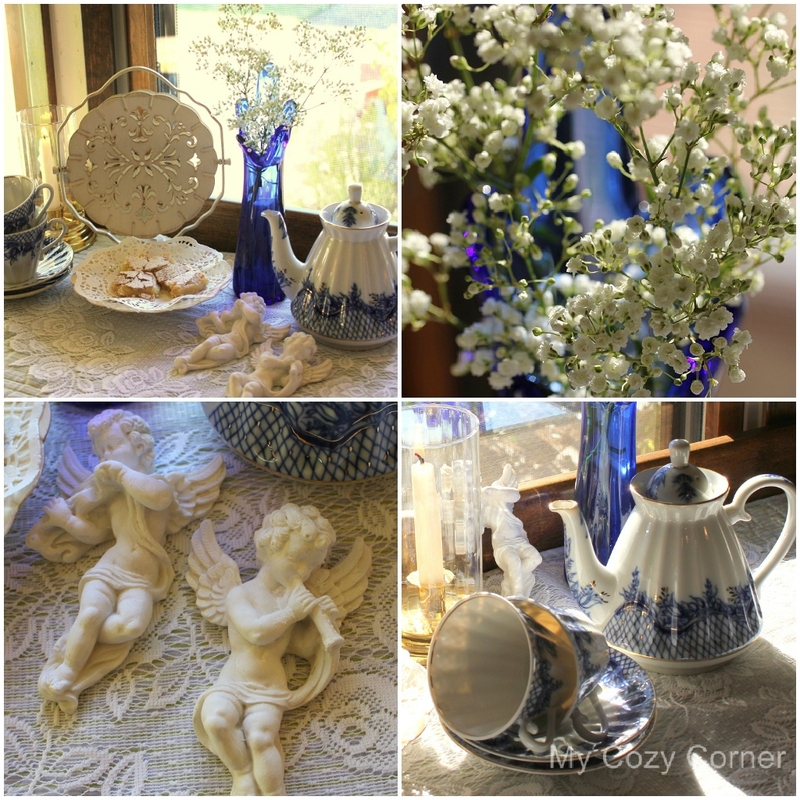 Your tea vignettes look amazing! I think your images are really great, I love the lighting! Your china of course, is a gorgeous subject too. Each blue and white piece is stunning. What a gorgeous pattern! Your images here show delicate beauty! Such a sweet vignette and who doesn't love blue and white! Your photography is wonderful and the whole scene is staged so well against the light. Thanks for sharing!! I'd say your photo skills are spot on! 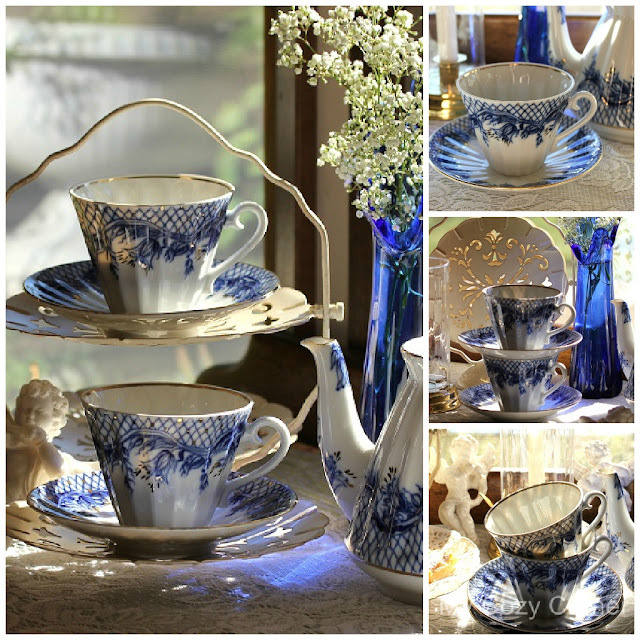 How lucky you are to have the Lomonosov Russian Porcelain teaset -- simply gorgeous! Happy Tea Day! So pretty! The sunlight streaming thru is amazing! I adore each and everyway you've displayed your tea cups and saucers! Your mosaic photography is elegant, dear one! Such a lovely post. Your tea set is so pretty. I too love Blue and White.. Your photos are very good.. Your tea vignette looks fabulous! Love Blue & white! Thanks for sharing your lemon square recipe! Wishing you all the best in 2013! 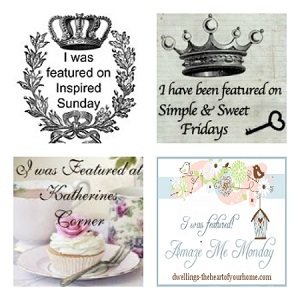 Thanks for linking up with Katherin's hop. What beautiful china! I hope your granddaughters enjoy drinking tea from this set and collecting their own! Betty this is absolutely gorgeous. xo P.S.>thank you for sharing at the hop. Wow this is amazing. Love the collection and the history. I am following you and I look forward to seeing you at My Dream Canvas. Lovely tea things splashed with blue! I love this blue and white china..it is to die for!! 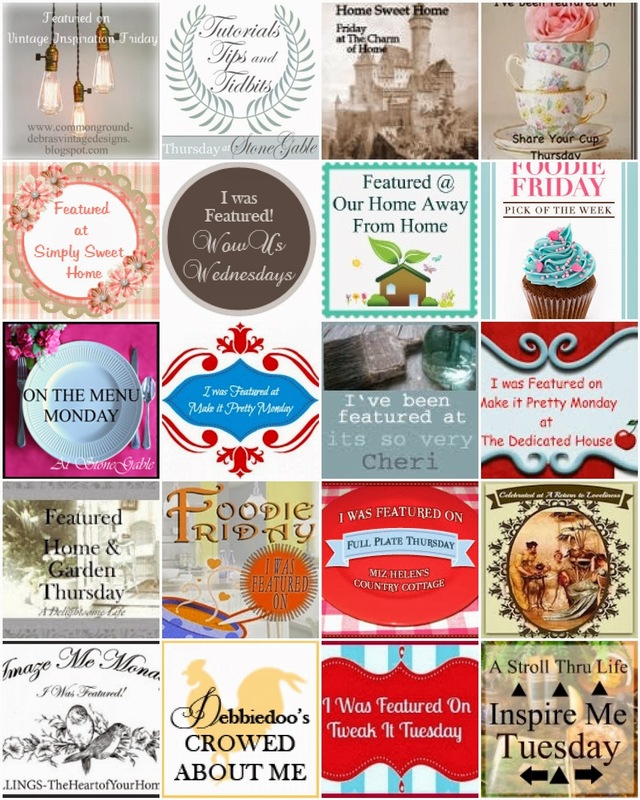 You are featured at Tuesday Top Tuesday and I just came to see and it is gorgeous! Have a nice week. Gorgeous china a wonderful photos. Your photos are great from my eye. Stunning describes all this post. Looks a magazine to me. I read this piece of writing completely about the difference of hottest and preceding technologies, it's remarkable article.